The U.S. Federal Reserve is stuck between a rock and a hard place. A September Fed interest rate hike seemed almost certain until a couple of weeks ago. It was slated to be be the first rate hike in almost a decade and a healthy sign of how much the U.S. economy has recovered since the recession. But the plunge in global stock markets, triggered by China's economic slowdown, is now raising doubts about a September rate hike. "This pretty dramatically reduces the likelihood the Fed will raise rates in September. That means the Fed is kind of trapped by all this turmoil," says Ed Yardeni, chief investment strategist at Yardeni Research. The Fed has been saying for months that a rate hike is very likely happening this year. So if it pushes off the hike, some experts say the central bank runs into a credibility issue. However, others argue there are greater risks to the Fed rushing and raising rates in September than to waiting until December. "I would wait: the risks of [raising rates] too soon exceed the risks of [raising rates] too late," says David Wessel, director of the Hutchins Center on Fiscal and Monetary Policy at the Brookings Institution. Wall Street certainly believes the Fed will wait. The probability of a September rate hike has been cut in half in less than three weeks. On August 6, investors believed there was a 51% chance of a hike. On Monday it was down to 24%, according to CME Group FedWatch, which tracks futures. Economists at Barclays went even further on Monday, predicting the Fed will delay raising rates until March. But on Monday, Atlanta Fed President Dennis Lockhart reaffirmed his stance that a rate hike will happen this year. "I expect the normalization of monetary policy—that is, interest rates—to begin sometime this year," Lockhart said in a speech in Berkeley, Calif. He did not clarify the timing, but in an interview with the Wall Street Journal earlier in August, Lockhart indicated he wanted to raise rates in September, barring some big decline in the U.S. economy. 1. Continued global stock market selloff: Stocks worldwide have been mauled in recent weeks. Many, including the U.S. and U.K., are in correction territory. On Monday, the Dow briefly plummeted 1,000 points at the open. If this global selloff continues in the next few weeks, most experts believe the Fed wouldn't want to roil markets further. 2. Another Fed president William Dudley is scheduled to speak Wednesday and could a hint on the Fed's latest thinking before the September meeting. 3. Annual Fed meeting: All eyes are trained on Jackson Hole, Wyoming, where Fed policymakers meet for its annual meeting Thursday through Saturday. Stanley Fischer, the Fed Vice Chair, will speak at a panel discussion. Fischer has been leaning towards raising in September. Given his high rank, if Fischer signals that the Fed should wait, September looks very unlikely. "His comments will be most telling," says Sharon Stark, market strategist at D.A. Davidson. 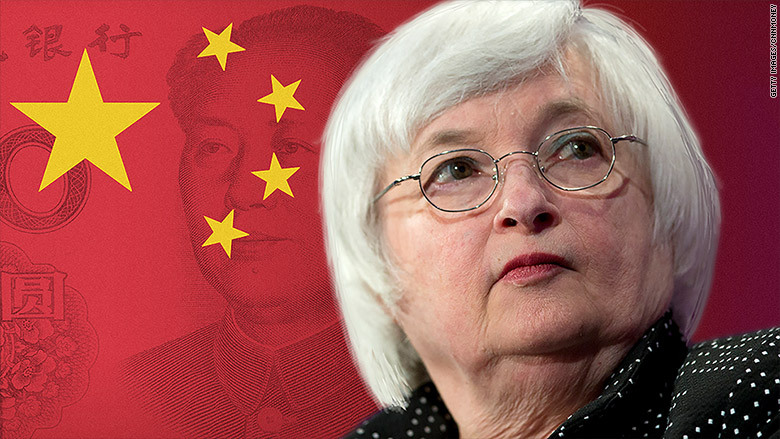 She says a September rate hike is already "off the table." 1. The U.S economy is still doing well. We get another look at America' economic growth between April and June on Thursday and almost all economists believe the growth number will be revised up. New home sales and retail sales were also picking up. September is still possible, says Paul Ashworth, chief U.S. economist at Capital Economics. 2. The job market is still strong. The U.S. economy has added 200,000 jobs -- the benchmark for a healthy gain -- in five out of seven months this year. The unemployment rate is at its lowest level (5.3%) since April 2008. 3. Then there is the credibility issue. Fed Chair Janet Yellen has said a rate hike will likely come this year but she hasn't clarified exactly when. Investors could read any signs of waffling from the Fed as a lack of certitude. Here's the case for pushing back the rate hike. 1. Investors are very concerned that China's economic slowdown is worse than the official numbers suggest. But no one knows how bad it is and what effect it will have on the global economy. 2. If the Fed's committee members decide to raise in September, they risk looking like they are blind to the selloff in global financial markets, says Stark. 3. The Fed has two goals: a good job market and steady inflation. The job market is good but inflation is flat and nowhere near the Fed's 2% goal.